SAN MATEO, Calif., June 20, 2017 /PRNewswire/ -- The post-mobile world is here and it is providing marketers with new challenges for delivering results and meeting customer expectations. By 2020, over 50 percent of all consumers expect to use AI and voice-activated technology in their daily lives. Today, 30 percent of all mobile searches have location-intent, while 5G mobile speeds are predicted to further transform mobile search in the next three years. A new survey released by BrightEdge, the leader in enterprise SEO and content performance marketing, reveals that marketers believe in a future ruled by the likes of Alexa, Artificial Intelligence (AI), voice search and the Internet of Things (IoT). Yet, most in-house marketers and agency practitioners have done little to introduce these powerful components into their content marketing strategy. BrightEdge surveyed 252 digital marketers at Fortune 500 brands that represent a split of B2B and B2C companies over a one-month period in April and May of 2017. The survey sought to understand how marketers are preparing for the accelerating consumer adoption of AI, voice search, and local search over the next year. The survey discovered that marketers recognize the AI, voice and hyperlocal revolution is here, yet, the majority of marketers are not planning to adapt their marketing strategies. This leaves brands at risk of failing to meet consumers rising expectations. Although marketers are behind the curve of implementing specific strategies rooted in AI, voice and local, the survey did reveal many Fortune 500 in-house and agency content marketing teams are taking the lead to develop and implement holistic strategies that integrate SEO, SEM, social media and content marketing, with the goal of delivering better results and a better customer experience. "It's a winner-takes-all in the post mobile world and marketing departments are adapting to changing consumer behavior," said Jim Yu, CEO of BrightEdge. "To thrive in a world where 'search is everywhere,' marketers must understand customer intent and use it to drive content strategy. That's exactly why marketing departments are integrating SEO and Content Marketing into a single function - it will drive better interactions, and thus better results." The 'future of content marketing' survey offers a bevy of insights to the current state of how brands are using content to interact with consumers. Significant shifts are taking place at the hands of the consumer. The marketing funnel itself is turned on its head; consumer-lead strategy is the wave of the future, and their expectations are higher than ever. Below are four key findings that illustrate the new content marketing landscape. Marketers are not preparing for the post-mobile world, where mobile search, voice search, local search and the increasingly heavy reliance on intelligent agents to find what you need are dramatically changing consumers interactions with brands. Marketers are still highly focused on just meeting the bar in the transition from desktop to mobile. In fact, 27 percent of marketers still believe mobile is "the next big thing." 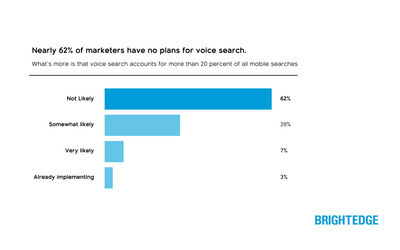 Roughly 66 percent of marketers have no plans to begin preparing for voice search. Yet, 31 percent of marketers believe it is the "next big thing." What's more is that voice search accounts for more than 20 percent of all mobile searches. Similarly, 32 percent of respondents believe artificial intelligence (AI) is the "next big thing," but 57 percent are "not likely" they will implement any element of artificial intelligence (AI) this year. Only three percent of respondents said they anticipate 5G mobile speeds being the next big thing –– but according to recent reports, this is projected to be a reality by 2020. Preparing to adopt new technologies is critical for marketers; however, as daunting as it may initially appear, marketers can begin to take actionable steps in their content development, according to Michel Kant, SEO Manager of Staples Europe. "Marketers looking to prepare to merge into an AI–first world are going to need to begin by making sure they have the same consistent message across devices, at the very least," Kant said. "If you don't have that in the near future, it will be like not having a mobile optimized website or good content marketing strategy now. It will be very costly to step up that pace." More content than ever before is being created, but it's vastly under-utilized by consumers. In this survey, respondents recognized the need to create content that's effective for local and mobile audiences, but again, are falling short of implementing the impactful strategy. Of the respondents, 71 percent reported that less than half of their content is consumed. Fewer than 9 percent of those surveyed experience three-quarters or more of the content they produce engaged with. B2C saw better odds of content consumption than B2B. The top three types of content created most often are blog content, social media content, and videos. The idea of mobile optimization has entered a new realm. Now, brands have to deliver customer results every time, catering to location, device and speed to deliver relevant and intelligent content that drives conversions. 51 percent of marketers labeled creating and optimizing content for local markets "very important" or "a priority" in 2017. 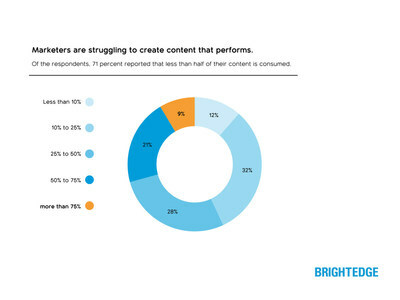 Nearly half of the respondents are using data to drive content strategy. This could explain the recognition of AI, voice, and local search impact, but point to the disconnect in the application and execution in content. A majority of the respondents labeled small custom content elements highly optimized for specific consumer searches and questions as micro-content. For the respondents, creating micro-content has now surpassed long-form, time investment-heavy initiatives like webinars, research reports and case studies in priority. Often a less glamourous but vital marketing function, search helps marketers discover consumer intent, providing useful insights to drive content marketing strategies. And SEO is critical for creating optimized content that is easily discoverable by consumers. The combination of SEO and content marketing create a new category focused on content performance and intelligent content creation. 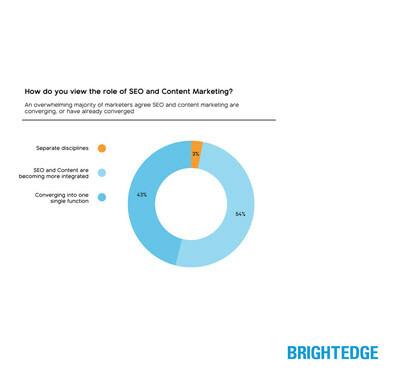 An overwhelming majority of marketers –– 97 percent of those surveyed –– agree SEO and content marketing are converging, or have already converged. In line with these findings, content and organic clocked in as the most important initiatives for marketers this year. Conversions, followed by engagement, and then traffic accounted for the top three answers respondents listed as the most important metrics of success for content performance. The marriage of content marketing and SEO offers one solution to reach those goals. 52 percent of the respondents recognized that fluency in SEO is critical to long-term content marketing success. Daniel Mooney, Director of Digital Analytics at Wiley, agreed marketers are migrating toward an SEO-forward content strategy. "The availability of data out there and the ease of use of analytical tools has changed both our strategy and execution of it," Mooney said. "The biggest thing we're doing now is thinking about the application of the research up front, not SEO as a strategy after launch." This change in consumer behavior and the related shift to mobile present new challenges and opportunities to marketers. Marketers are neglecting to adopt technologies that have already surpassed the market introduction phase. What's clear is that intelligent content optimized for increasingly sophisticated consumer outlets requires a new approach by a multitude of marketing disciplines.